Get Your VICS: Regulations to prohibit bringing aquatic invasive species into Lake George began with the 2014 boating season and continue today. Vessel inspection technicians must inspect every trailered boat before entry into the water and decontaminate the vessel, if necessary. Once the boat has been inspected, it will receive the vessel inspection control seal (VICS). No boat will be allowed to launch without an intact VICS Seal. These rules apply to all 86 public and private launches, with a $500 fee for violators. For complete information, check out the Boat Inspection Checklist from the Lake George Park Commission. Everyone knows the phrase, "It is all fun and games until _____". On a populated lake, these sorts of situations can occur, and while everyone also knows the phrase "accidents happen", many unsafe situations can be easily avoided simply by being familiar with the rules. Lake George is a unique lake, and therefore it has special laws that differ from other lakes in the region and in New York State. These laws are enforced by the Lake George Park Commission (LGPC) and the Warren County Sheriff's Department. 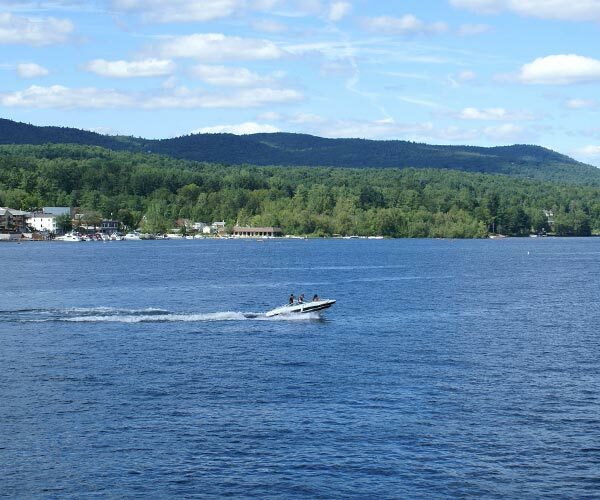 A boater should not enter the water without first realizing some of the different rules that Lake George maintains. All vessels that are 18ft or longer, or are mechanically propelled by motors of 10hp or greater, must register with the LGPC and display a registration decal. If the boat was painted with anti-fouling paint containing TBT, or Tributylin, it is not allowed in the lake, unless it was applied in New York State by a registered Commercial Pesticides Applicator (for more information, see the New York State Department of Environmental Convservation website, listed below). Remember to be prepared for sudden weather changes. The shape of Lake George, 32 miles long and 3 miles wide at its breadth, makes it oblong and narrow and ripe for furious winds. Make sure there is a life-preserver onboard for every passenger. Powerboats in Classes A and I must carry a fire extinguisher, navigation lights by its length, a horn or whistle that is audible from a distance of at least a half mile, distress signals such as flares, an anchor of sufficient strength and a line of sufficient length. Boating under the influence of alcohol and consuming it on board is dangerous, illegal, and strictly enforced. However, passengers may consume alcoholic beverages on private boats on the lake. Because the lake is not exclusively used for boating, vessels must respect less powerful users of the water. Vessels should avoid red scuba divers' flags, swimmers, paddle boats, and other small objects in the water by a distance of at least 100 feet. Personal water craft (PWC) may not be operated within 500 feet of the outer boundary of a designated swimming or mooring area. Vessels cannot be anchored, moored, or recreated from within 200 feet of private property shoreline without the express permission of the property owner or lessee. Canoe paddlers should be warned that canoes are better for shoreline boating than use in the main lake. The speed limit is 5mph when within 100 feet of shore, dock, or stationary vessels such as boats, rafts, floats, etc. In the main lake, the limit for daytime hours from 6:00am to 9:00pm is 45 mph. In the nighttime, the limit drops to 25mph until 6:00am. Buoys throughout the lake alert boaters of speed restrictions in certain areas. In crossing situations, the boat on the starboard (right) side has the right of way. A boat being overtaken by another also has the right of way. Powerboats must yield to sailboats that are under sail alone and windsurfers, except when the powerboat is slower. Remember that weather is unpredictable and sudden, and wind gusts can change speed and direction. Do not cut in front of the bow of any wind-powered vessel. If two powerboats are meeting head-on or nearly so, they should pass port-to-port (left side facing left side). Boats with a water ski, waterboard, or tube attached are required to have an observing passenger age 10 or older. Skiers and related personnel must wear life-saving devices. This activity is prohibited from dusk 'til dawn. No dumping is allowed, and boats are required to have sealed heads and holding tanks for showers and sinks. This prevents pollution to the water which many residents of Lake George use for drinking, and many wildlife species call home. The steep mountains on each bank amplify noise that disturbs locals and visitors alike, so there is a decibel limit of 86 from 50 feet away, and no more than 80 if recorded from 100 or more feet away. Noisy Personal Watercrafts, such as water bikes or jet skis, are only permitted on the lake from 8:00am to 7:00pm, or sunset, whichever is earlier. There are also several Restricted Use Zones on Lake George - including Sandy Bay and Paradise Bay - that are detailed on the LGPC website, listed below. A hydrographic map may be obtained at marinas on the lake. Keep checking the wake of the boat regularly to ensure that it does not become a hazard for populous on the shore, or for other vessels. Though it looks like a lot of rules, an experienced and courteous boater will know that most of these are common sense safety laws. Each is easily observable and hardly a sinker on the amount of fun there is to be had while visiting Lake George and sailing on the unforgettably stunning waters. For more information, please visit the Lake George Park Commission website at http://www.lgpc.state.ny.us/ or the New York State Department of Environmental Conservation site at http://www.dec.ny.gov.